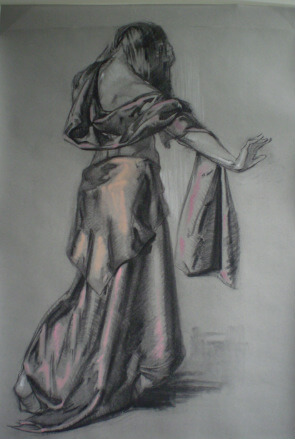 Yesterday, I completed my workshop on Drapery and the Figure. It was a dynamic group with a range of skill sets. All were committed to the figure and approached their work with serious intent. It is always a pleasure as an instructor to have such students. They excite me as I hope to excite them about the beauty and grace of the figure. The more successful drawings contained the proper action that identified closely with the model. They also contained a level of emotion that was tactile. The drapery added and brought out these underlying things and carried the movement and composition to a more dramatic closure. All successful drapery drawings depend on a solid armature. Just as a sculpture cannot be started without an armature that is properly proportioned and contains the right amount of action, drapery cannot be modeled upon a figure that is flawed. The movement, proportions and a sense of balance must be evident prior to designing the drapery. Memory plays a huge role in successfully being able to compose drapery without the use of a lay figure. One needs to hold in one’s memory the movement of the drapery as the model reveals it through the action of the pose. Each time she takes a break and returns to the pose the drapery will be different. But there will be certain folds that will repeat themselves. These are the folds that one must retain. These repeating patterns re-occur because of the tension between model and drape. These points of tension must be observed carefully. There are also points where gravity acts on the drapery- folds falling from points on the model that are directly revealed through the drape, i.e. the shoulders, hip, elbow, knee etc. Without these two aspects in the drawing the underlying figure cannot be understood- its essence will not be revealed. Differences between fabric drawn upward and fabric allowed to fall naturally must also be noted as well as differences between types of fabric- i.e. silk or wool. In designing the drapery one must adhere to the underlying forms, eliminating any folds that conflict with the general movement and form of the figure. This is paramount, all else is superfluous. When one reaches the stage of modeling ( that is the rendering of light and shadow), one must be conscious of the figure and how say, the form of the deltoid is revealed in the shadow pattern of the drape. The drape must always be subordinate to the armature.There must be a conscious unity between figure and drape, successfully carrying the patterns of light and shade between the underlying as well as the exposed forms on the figure to the drape itself. One must also note how these patterns of light and shade effect the over-all design. This will affect the larger rhythm of the piece. The most challenging aspect to rendering drapery successfully is to be conscious of one’s idea of the image. When one has set the idea in memory, one can then successfully compare what lies before one in the form of the model to this idea. Without the idea it is easy to be swayed by the changing aspects of the drape and lose oneself in the process. The idea must be held in memory allowing memory to determine what works. One thing I learned that enhanced the student’s ability to make use of his memory was allowing him to make a sketch of the draped figure prior to working on the larger armature. It was a way for memory to remain conscious and keep the student on the path that most adhered to their emotional center. I intend to keep this as part of my instruction next time. Your workshop was inspiring ,rewarding , challenging and fun for me. You gave very good examples and demonstrations. It was especially exciting to explore the expressive possibilities of the drapery -to work out a design amidst all the changes during an extended pose. This was also the most difficult aspect for me but when ever I began to flounder you came around and helped me get the drawing moving forward again. 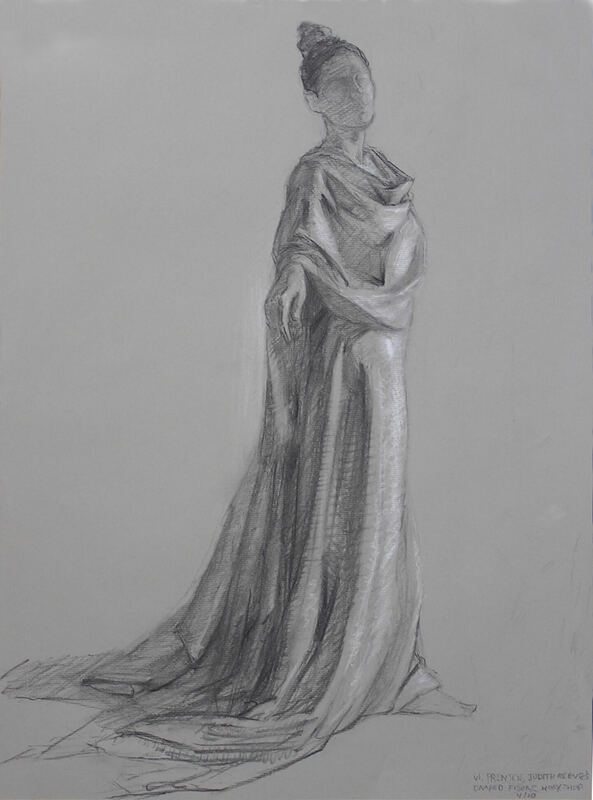 Doing the short sketch of the draped figure prior to the long drawing was also very helpful. You do a very through job in your teaching and I learned a lot. Terrific model to. 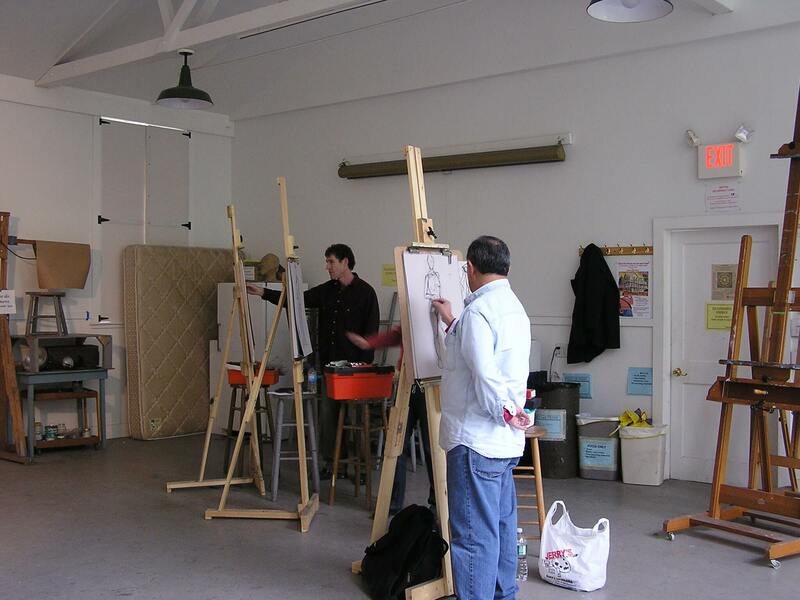 I am very much looking forward to your figure painting workshop this summer.